"No Cs in our name, Nothing average about our patterns!" All illustrations, text and designs contained in this site are © Copyright 1982-2012 Kannik's Korner, or its licensors. All rights are reserved, and none may be used without prior written permission. Page under construction! More Photos coming! 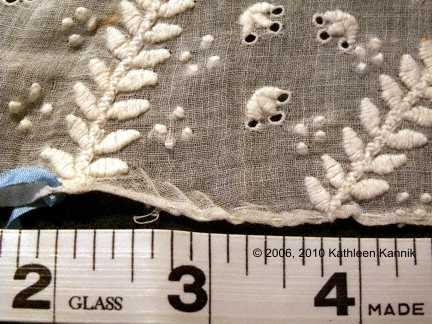 Above: This is a photo of the original cap, showing the full embroidery. The blue ribbon is not original, but has been run through the eyelet holes to draw the cap up to show the shape as it would be worn. Please note the starch is weak, so the front is drooping. Click image! Photos © 2006, 2010 Kathleen Kannik, used by permission of Susan Greene. 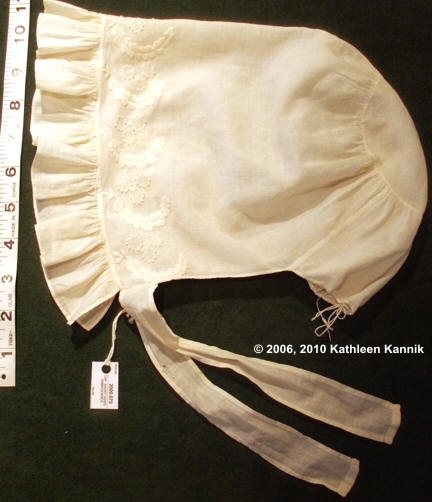 Cap now located at the Susan Greene Costume Collection at the Genesee Country Village & Museum, Mumford, New York. Above: Detail of the embroidery on the original cap. The stem line on the left encases the seam. The full embroidery pattern is included in this pattern. Only White floss should be used, but variations of stitches could be used. If doing embroidery on your cap, we recommend using at least a row of something along the seam line, and the same on the line which echoes the seam and enhances the elongated shape of the cap. Click image! Left: This is a photo of the original cap. Notice the embroidered border, which runs from side to side in a continuous line (no reverse from one side to the other). The main headpiece section of the cap is whip gathered to the circular back piece, and the ruffle is whip gathered to the headpiece. Note the small cord used in drawing up the back neck. Click image! Above: Sample bonnets, left to right - View F (pink and green bonnets), View E (stripe), View C (blue). See pink and green bonnets above.